Graystone struggles to find a way to bring his daughter’s avatar to life. This study is based on the unrated, extended version of the 2-hour pilot available on DVD. I will point out differences between this version and the television version as we go along. On the unrated version, at the Caprica Bucaneers pyramid game, a security guard opens a gate at the edge of the arena to let the Bucaneers players out to their locker room at the end of the game at 51:51 on the DVD. The vertical edge of the left gate jam has "#53 B.C." handwritten on it. "B.C." probably stands for British Columbia since the pyramid scenes were shot at General Motors Place, the home arena of the Vancouver Canucks National Hockey League franchise. General Motors Place has since been known as Rogers Arena, having changed sponsors in 2010. The blue, white, green, and silver colors of the Bucaneers are the same as those of the Vancouver Canucks. On the televised version, the pyramid game has been completely reshot. The game no longer takes place at an indoor arena, but a huge outdoor stadium. Daniel's seats are in a large skybox and not courtside. At 59:09 on the DVD, several book titles on the shelves in Daniel Graystone's home work area appear to be slightly altered versions of real Microsoft-related tutorial books. Three of the titles appear to be Windoms, Excel Mail, and Word Powerplant. Another book, a couple shelves down from these, appears to be titled Linux, an open-source operating system developed by Finnish-American software engineer Linus Torvalds. At 1:00:00, a book that appears to be called Sharkwave is seen, a play on the Shockwave animation software found on many websites. While describing his desire to bring the Zoe avatar to life in the real world in a physical body, Daniel dismisses Joseph's remark that she would be "like a robot", saying they are talking about a Cybernetic Life-Form Node. Later in this episode, Daniel explains to his backers in the Caprica defense department that the U-87 robot is a Cybernetic Life-Form Node, a CYLON. Daniel asks Joseph to use his connections to the Ha'la'tha to steal the micro-cognitive processor from Vergis Corporation to help restore both Zoe and Tamara to life, saying, "If I'm wrong, have me beat up, have me killed. I don't care." In "Reins of a Waterfall", Joseph does have Daniel beat up when Daniel fails to return his calls about seeing Tamara again. Minister of Defense Chambers wears odd-looking, thick glasses that are similar to those worn by Dr. Tyrell in the 1982 film Blade Runner. The show's executive producer David Eick is a huge fan of the movie. 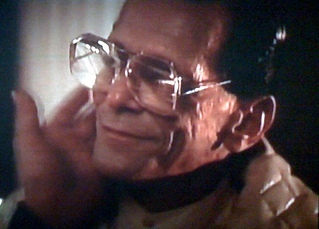 Additionally, in Blade Runner, Tyrell is the inventor of replicants, human-like androids almost indistinguishable from humans, similar to what will eventually evolve among the Cylons. As the U-87 starts to come to life after Daniel loads the Zoe avatar program into it, it's right hand starts to twitch. In the 1931 classic film version of Frankenstein, the first sign of life in Frankenstein's monster is the twitching of its right hand. Up to now, the U-87 had a whitish-yellow eye light in its visor. Just before it begins to speak in an electronic approximation of Zoe's voice, the eye turns red (the traditional Cylon centurion eye color fans have come to know from both BSG70 and BSG2000). It goes back to whitish-yellow when the avatar program seems to fail to remain in control of the robot just seconds later. Why does Daniel act as if the Zoe avatar is lost for good when the U-87 collapses? Electronic data stored on a drive is almost infinitely reproducible, so he could just upload another copy of the Zoe avatar to the MCP (or to a future version of the MCP if he thinks this one has failed). At 1:21:27 on the DVD, some wrinkles are visible (in the bottom-right corner) on the black virtual wall in the VR world. This is an indication that the walls of the set were simply covered with black sheets to achieve an effect of indeterminate black surroundings. At 1;21:54 on the DVD, a toy of a four-headed beast is sitting on the mantle next to Willie. 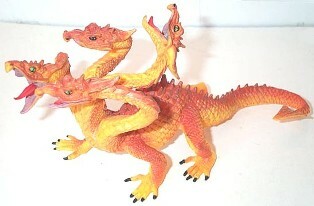 It appears to be the Four Headed Orange Dragon figure from the Knights and Dragons series made by Safari. The shot mentioned above does not really seem to make sense when combined with the later shots of Joseph walking into Willie's room and speaking to him; the angle is wrong from the perspective of the doorway Joseph is supposedly looking through and the mantel seems to disappear in these later shots. At 1:22:02 on the DVD, Willie's room has a poster of what appears to be an anime or manga type character called Storm. I'm not aware of a character quite like this one in our world, so it is presumably a Colonial fictional character. Joseph explains to Willie for the first time that his namesake, his grandfather, William Adama, was killed during the Tauron uprising when Joseph was just a boy. In "The Dirteaters" we will learn that Joseph shot his father himself after the man was tortured into revealing the names of members of the Tauron resistance. The Caprican military officers seen standing behind Daniel at the demonstration of the U-87's capabilities are wearing uniforms similar in design to what will be seen worn by officers of the Galactica in BSG2000.